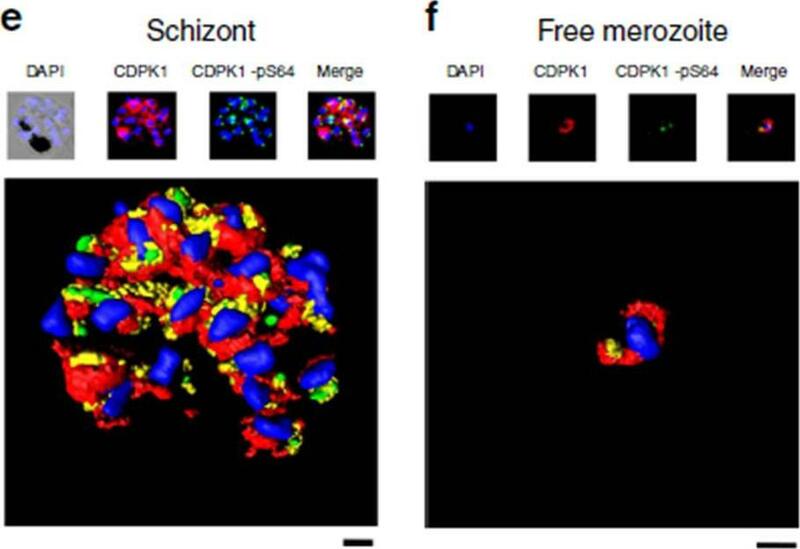 Subcellular localization of PfCDPK1. Sections of P. falciparum (clone K1) erythrocytic stages were incubated with the affinity-purified PfCDPK1-specific antibody 2129 and binding was visualized using gold-conjugated protein A. A and B. Gold particles indicative of antibody binding associated with the parasitophorous vacuole and intracellular vacuoles (intraparasitic vacuole) of schizont stages. 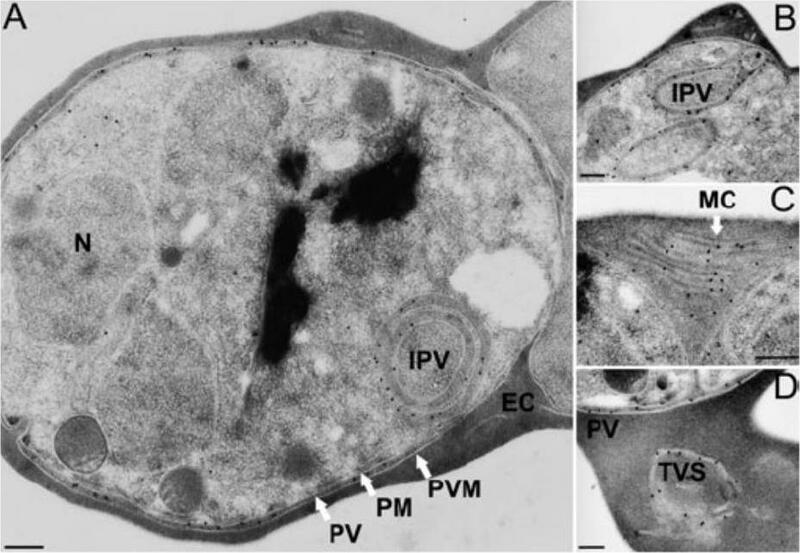 Intracellular vacuoles originating from the plasma membrane of the parasite (B). C and D. Sections of erythrocytes infected with two schizonts and one schizont, respectively, showing labelling of the tubovesicular system in the host erythrocyte. The membranous structure visible in the erythrocyte cytosol in (C) is also known as Maurer’s clefts. EC, erythrocyte cytosol; MC, Maurer’s clefts; IPV, intraparasitic vacuole; N, nucleus; PM, parasite plasma membrane; PV, parasitophorous vacuole; PVM, parasitophorous vacuole membrane; TVS, tubovesicular system. Size bars (200 nm) have been inserted in each panel. Möskes C, Burghaus PA, Wernli B, Sauder U, Dürrenberger M, Kappes B. 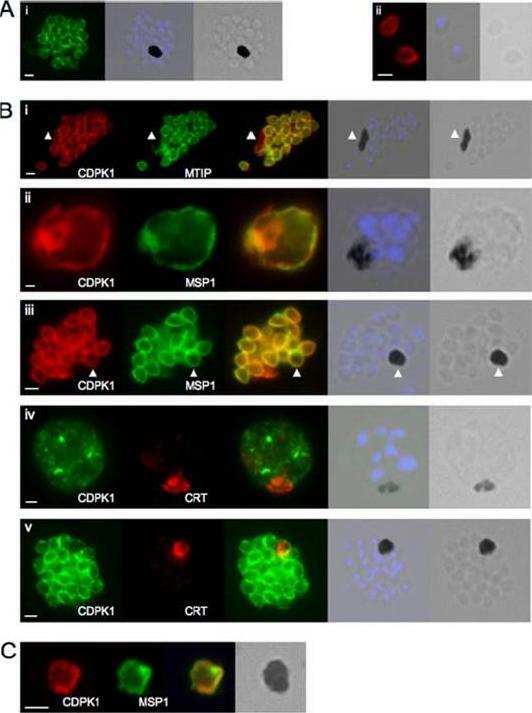 Export of Plasmodium falciparum calcium-dependent protein kinase 1 to the parasitophorous vacuole is dependent on three N-terminal membrane anchor motifs. Mol Microbiol. 2004 54:676-691. Copyright John Wiley & Sons Ltd. 2010. Inhibition of PfCDPK1 has no effect on asexual parasite growth. Immunofluorescence using anti-HA and anti-CDPK1 antibodies confirms that CDPK1 T145G-HA (a gatekeeper mutant) localizes correctly to the plasma membrane of parasites. Scale bar is 1 μm.Ansell KH, Jones HM, Whalley D, Hearn A, Taylor DL, Patin EC, Chapman TM, Osborne SA, Wallace C, Birchall K, Large J, Bouloc N, Smiljanic-Hurley E, Clough B, Moon RW, Green JL, Holder AA. 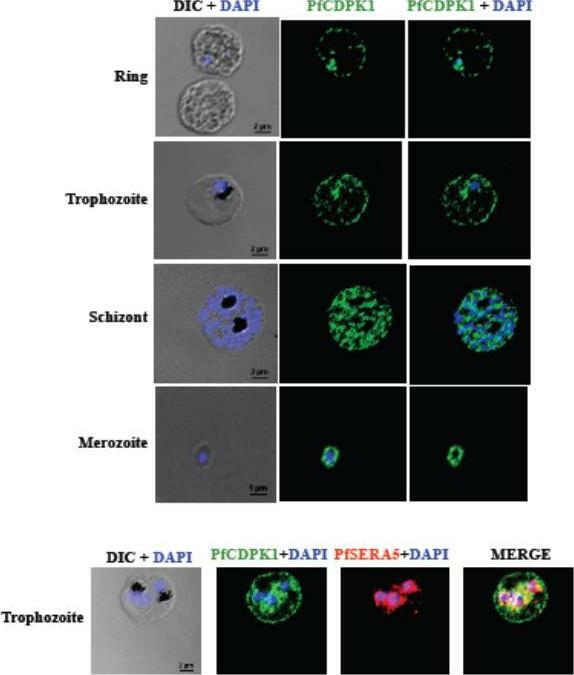 Biochemical and antiparasitic properties of inhibitors of the Plasmodium falciparum calcium-dependent protein kinase PfCDPK1. Antimicrob Agents Chemother. 2014 58(10):6032-43. IFA was performed on PfCDPK1-3HA-DD parasites using anti-HA antibody to detect CDPK1 and anti-IMC1g antisera. Scale bar is 2 μm. Data strongly suggest that PfCDPK1 is a major kinase that phosphorylates IMC1g in the parasite. Moreover, PfCDPK1 exhibited localization in close proximity with IMC1g in the parasite, which was reflected by overlapping fluorescence in IFA.Kumar S, Kumar M, Ekka R, Dvorin JD, Paul AS, Madugundu AK, Gilberger T, Gowda H, Duraisingh MT, Keshava Pr asad TS, Sharma P. PfCDPK1 mediated signaling in erythrocytic stages of Plasmodium falciparum. Nat Commun. 2017;8(1):63.